I love our house, but it is older and when they build our home there was little to no thought about being energy efficient or what weatherstripping is. To say it was drafty was an understatement! The seal on our side door was so bad that one year after an overnight show storm we had a little pile of snow that had built up on the INSIDE of the house. Something needed to be done. This was the first job. I have used a bunch of different products over the years to seal doors with mixed results. 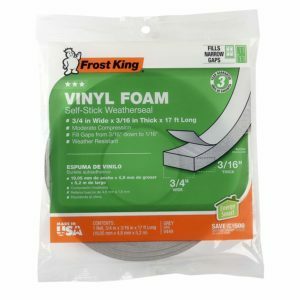 Because the doors are in constant use I found the best option was simple closed cell foam strips that are highly compressible, cheap, and easy to replace. You will need to play around with thickness a bit to get a good seal. Too thick and your door will be hard, or impossible, to close. Too thin and there will be a gap letting air in. 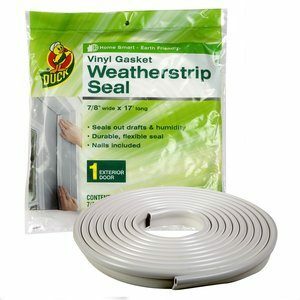 Here's a quick tutorial on how to install the weather stripping on a door. When doors are installed they are hung in a door jam. That whole unit (the wood all around the door and the door itself) is then attached to the frame of the house. They very rarely fit perfectly flush and are almost always shimmed. The trim around doors, and windows, covers up this gap. Sealing up these areas requires taking off the trim carefully. Once exposed you might be surprised to see there can be huge gaps between what looks like the inside of your door and where it attaches to the house. To seal these gaps I used a low expanding spray foam designed for doors and windows to fill and space and then after it dries I cut away any excess with a knife and reinstalled the trim. All the openable windows in the house are the style of window that swing open not slide. for these I used vinyl gasket seals. They are slightly more expensive than the closed cell foam I used on the doors but since they get far less use I have never needed to replace them after several years. It installs in much the same way as the door seals do and takes just a few minutes per window. It can be a bit tricky to install the first time you do it. After a few times however It takes me a few minutes per window at most. Here's a tutorial video if you are stuck. There you have it. For a only few bucks and a couple of hours of your time you can not only save a lot of energy but you will make your home far warmer, less drafty and just more comfortable to live in.